Hello Nosh Show Listeners! We are back with another three man episode as our bud Ryan does a bit of traveling. Have no fear though, we fill his spot with lots of tangents and side stories. Plus, our new segment has a name, it's "Nosh it Now" and I chose to try Smash Mallow this week. Smash Mallow came out last year and currently comes in seven different flavors. I spied it once or twice before, but it was half off at Wegman's which means $1.49 for each 4.5 ounce package (they are four bucks a package if you order from their website). I don't want to ruin the surprise too much, but I did not like these at all. Granted, I am no churro expert, but I thought the idea was for churros to be delightful and sweet. 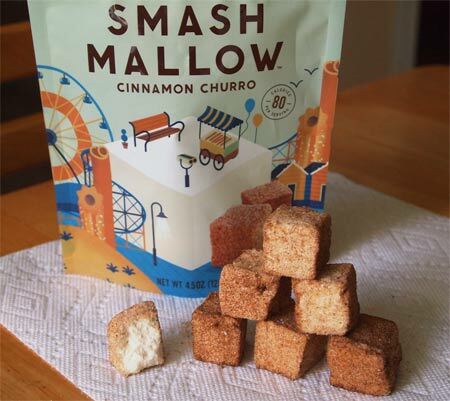 Instead, Smash Mallow tries to get a little cinnamon heat going and I do not approve. Go ahead and give the episode a listen for my complete reaction. I tried it as a free sample at BJ's and the Fancy Food Show. I did kind of like it. I think it would make a great change up for smores. Maybe that could work out. Dark chocolate with cinnamon churro marshmallow. I wonder did you try it toasted? I did not! I have several left so I will give it a try. Ugh. Smash mallow. I gifted a package of churro to a friend who's gluten-free and picky and loves cinnamon. She was polite when I asked how they were, but I could tell they weren't what I'd hoped. Months later I bought a bag of the strawberry to try, and they taste exactly like cough syrup! They are irredeemably bad. So disappointed. Glad to hear you call out the change in the Pizza Hut pizza at Target. My wife and I have tried it a couple of times thinking we just got a bad pizza, but no, it appears to be a permanent change for the worse. @Joseph: yeah, we were hoping it was a fluke as well. BOOOOOOOO. We tried a few different flavors of the Smash Mallows. We didn't really like the cinnamon churro or the strawberry very much, but the lemon poppy seed, root beer float, and mint chip ones were actually pretty tasty. So what the outcome of the toasted method?